Succeeding the popular Trainer HD app, Fretuoso includes some major new features and fully integrates with the latest iOS 9 system from Apple. It is also one of the first music apps to take advantage of the large screen of the new iPad Pro. 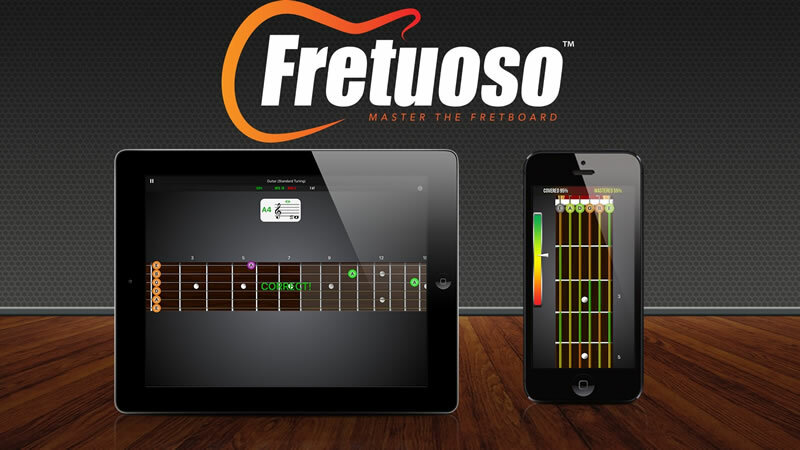 Fretuoso is a fun way for musicians of all ages and skill levels to perfect their working knowledge of the musical notes on the fretboard of their instrument, via a variety of training modes. Fretboard training helps memorize the location of notes on the fingerboard. Staff training tests the user on their ability to map standard musical notation to the instrument. Game mode makes learning fun and challenging with levels of increasing difficulty. Free play mode allows to explore the fretboard freely, optionally showing notes fitting a scale or mode of the user’s choosing. Supporting guitar, bass, ukulele, mandolin and banjo, each available in a wide variety of tunings, the app covers all popular fretted instruments. The app offers a large range of settings allowing musicians to finely tailor their training to focus on areas of particular interest. The free edition of Fretuoso can be downloaded from the fretuoso.com website and directly from the Apple App Store. Several additional editions including fully unlocked instruments are available for sale separately. Fretuoso is available for all iPhone, iPad and iPhone touch devices running iOS 7.1 and later. Follow Fretuoso on Facebook at facebook.com/Fretuoso, and on Twitter at @fretuoso.